Forget or Forget About It? Can you imagine waking up and having lost ten years of your life? What Alice Forgot by Liane Moriarty is a Rip Van Winklish tale about a woman who finds herself on the gym floor, dazed and confused, thinking she’s still 29, instead of 39. Twenty-nine is a great age. Just ask my sister, she claimed it for a decade, too. But the reality is, that’s just in her mind—Alice, not my sister. My sister has moved onto thirty now. For Alice this wasn’t a choice. She unwittingly missed ten entire years of her life. Let’s face it, a LOT can happen in ten years. While hairstyles, SUVs, world events, politics are all foreign to her, Alice’s main focus is on the drastic changes in her personal life. When Alice was 29, she and her adoring husband Nick were awaiting the birth of their first child. They were so in love. Unbeknownst to her after that gym workout gone bad, she already had her baby and two more to boot. That’s the good news. The bad news is that their marriage has disintegrated. She and Nick are in the middle of a nasty divorce. Every now and then in her new reality she gets hints that she’s not the person she thought she was. She’s now a skinny over-organizer who has to have things just so. Is she to blame for the divorce? Talk about a rude awakening. And that’s not all. No stone was left unturned. Everything but her address changed. There’s a certain coolness between Alice and her sister, Elizabeth, and Alice has no idea why. Her mother is now married to her soon to be ex-father-in-law. And, who is this mysterious “Gina” woman who keeps creeping up in their conversations? 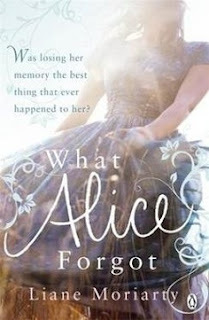 As Alice unravels the lost years, she has to decide is her marriage worth saving, or should she forget about it. This was one of my book club selections. The ladies enjoyed the book, and though some were waiting for more action, they liked the story and the way it kept us guessing as to what was going to happen.